UCSC has appointed Stephen Thorsett to serve as dean of the Division of Physical and Biological Sciences. The UC Board of Regents approved the appointment May 18, effective July 1. Thorsett, a professor of astronomy and astrophysics, has served as acting dean of physical and biological sciences since 2005, when the previous dean, David Kliger, was appointed campus provost and executive vice chancellor. "Professor Thorsett has shown himself to be an exceptional leader with well-developed management skills," said UCSC Chancellor Denice D. Denton. "He has a strong commitment to diversity and a genuine interest in the well-being of all the disciplines for which he will be responsible." Thorsett's accomplishments as acting dean include a newly updated academic plan; leadership of the campus's California Teach Program to increase the number and quality of science and math teachers in California schools; and the establishment of a task force designed to study the climate for women faculty in the division, one goal of which is to promote women and minorities into academic leadership roles. "I'm honored and delighted to have this chance to work with my colleagues from the science division and across the campus on building and strengthening our educational and research programs," Thorsett said. "Our students and faculty already make important contributions to environmental science, biomedical science, and the development of advanced technologies. An important goal for me will be to better connect our programs to partners both inside and outside our local region who share our interest in these societally important research areas." Thorsett's considerable administrative experience at UCSC includes service as associate dean in the division and chair and associate chair of the Department of Astronomy and Astrophysics. He also chaired the Academic Senate Committee on Research and served for two years as the Senate's parliamentarian. In addition, he has been a member and subcommittee chair for the universitywide Committee on Research Policy and has served on numerous national and international advisory and review committees and panels. The author of more than 100 scientific publications, primarily on radio pulsars and gamma-ray bursts, Thorsett has made important contributions in astronomy and astrophysics. He has used radio pulsar timing to confirm aspects of general relativity and to investigate binary systems, neutron star masses, and planets around pulsars. Thorsett uses all of the major national radio telescope facilities in his research, as well as the Hubble Space Telescope, and he is a core member of the science teams of two major NASA satellites for high-energy astrophysics (GLAST and NuSTAR). Thorsett earned a B.A. in mathematics from Carleton College and M.A. and Ph.D. degrees in physics from Princeton University. 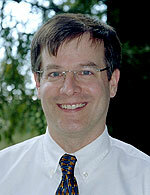 He was an assistant professor of physics at Princeton University before joining the UCSC faculty in 1999. Thorsett lives in Santa Cruz with his wife and daughter.